Writing Poll: How do you write distinctive character voice? 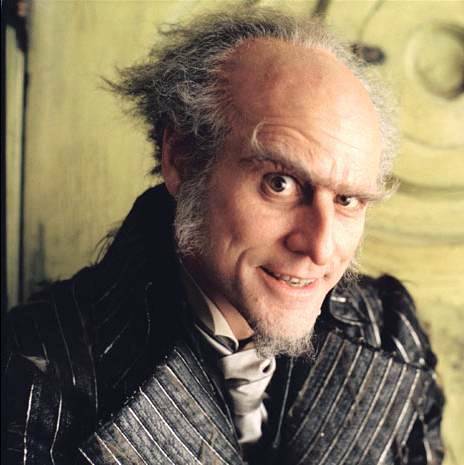 Jim Carrey as Count Olaf in "A Series of Unfortunate Events" - an extremely silly, but memorable example of a distinctive character voice in action. What techniques could a writer use to make the characters sound more distinctive? One of the problems we writers face is having convincingly distinctive character voices. Writing Fiction puts many demands on our brain. Between story structure, plot, setting detail, action and everything else, something is bound to get overlooked during the first draft. As a result, sometimes the characters in our story, although they are distinctively different people, all come across as sounding the same – like the writer. Let’s say we already have the first draft, and during our edit we want to focus on character voice. Any advice for how to go about this? One of my “writer-weaknesses” right now is that I’m not practiced in making things as dark as I want them to be. When I read a really good Fantasy, I often sit and ponder in dismay at how the author was able to make the villain so bad/ the main characters so flawed/ have something so horrible happen to the characters we love. I know I have my own tastes, as well. Reading some horror has helped me find where the parameters of these tastes end. I used to say I hated horror. Now I know I was wrong, but not about modern horror – most modern horror falls under “slasher” or “demonic possession”, and I am still not in the least interested in these stories. But classic horror involves a character facing an external darkness, and at the same time dealing with an internal darkness. In this way, horror is a very moral genre. Take “I am Not a Serial Killer” for example. The main character is John Cleaver, a fifteen-year-old sociopath. He his a messed-up kid, and thinks about some really awful things. However, he is very strict with himself. Having a fascination with serial killers, he noticed some parallels between these killers’ early behaviors and his own. For this reason, he sets himself some very strict rules. Thematically, the second book goes even further into John’s struggle with “Mr. Monster”, and so far it is my favorite in the series. The parameter was very comfortable for me. John thinks and says some pretty disturbing things. Sometimes, when life is getting out of control and his grasp on things loosens, he is capable of some pretty disturbing things as well. But John does not want to do bad things – in this way, he’s a very good person. So far, that’s where I feel comfortable. Yesterday I wrote my first draft of a horror short-story, about a man becoming a demon. The whole story is based around what could happen to turn a good man into an evil one; and because it is being told to you past-tense by the demon himself, it can be very disturbing. What I hope will be most disturbing about it, once it’s been through a couple more drafts, is the amount of human you can see in him. The story is meant to be dark and tragic; but is there a little bit of the man left in the demon, when all is said and done? Is he beyond salvation still? I’ve had a concept for a long time in my head, an urban story involving a young man who carries drought with him. That concept alone isn’t enough to carry a story, but I want to combine it with other elements that, in the grand picture, could be a fun story to read. What I’ve been trying to do with my writing, and particularly with my short fiction, is to focus on getting one thing right at a time. During “The Cellist”, my goal was to follow a character with undesirable traits, but still hopefully in a way so the reader feels empathy for him. This is crucial in order to trigger the right emotions at the end; we can’t feel anything for a guy who is so despicable we don’t want to see him become happy. It was a more difficult balance to maintain. I learned a lot from writing that story. This next one, I’m thinking about making a longer, sort of novella-length story. I’m going to stick with 17,000 words if I can. The focus, this time, comes from my inexperience writing female protagonists. My first approach in brainstorming today is to figure out the girl first. I want to make her a three-dimensional, real character; completely separate from the male protagonist. I think I’ve written enough male protagonists that I’ll fall right in to how he thinks and talks without a problem; for her, I’ll need to spend some time getting to know her motivations. My hope is that by getting her motivations figured out, and really getting her figured out as a person, then I can start discovery writing and see how the pieces fall into place. I might even decide to make her the main viewpoint character, but I’ll make the final decision on that once I’m getting closer to draft time.